Freaky Smudge: Fashion Week from my couch! Some great stuff coming our way it seems - patterns of a ... tribal sort if I may call them that. They kinda look like the Lily of France design ??! Floral making a lovely appearance on the whole. We can also see pastels mixed with darker colours (a new autumn look). Animal prints and fringes - where would we be without them? :P Fall 2013 has a certain.. I don't know I guess boldness about it! Something striking... Violent is not the word but there's a real feminist power like mixed with fire, if ya get me! Not the best with conveying this, sorry! Hopefully someday you'll be seeing my designs on these runways, coming to life! That's my dream (apart from the whole regular family, house, kids, etc.) but that's what I want. I want a line that says "Alexander McQueen meets Vivienne Westwood, and did a swingers thing with Balmain and Meadham Kirchoff" - strange I know but if you keep reading my blog you'll get to know I'm a little... weird and corny! 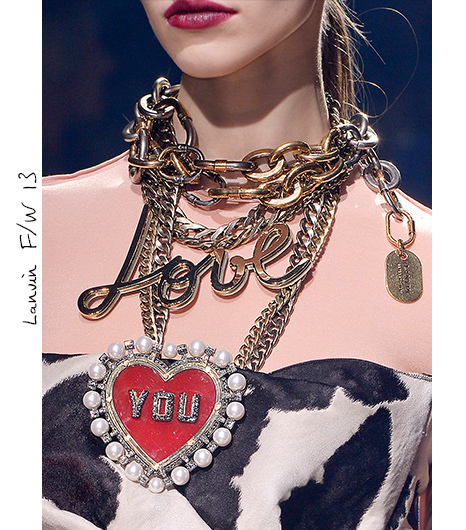 LANVIN - wow that jewellery is bright! Loving the velvet! And the "you" heart necklace :) Actually I'm really just looking out for the necklaces here, they are pretty cool! I'm going to do more from my end here and report back!